You know how we tend to overlook the little issues that our friends might have? You know, maybe you think your friend's wardrobe is an assault on the eyeballs of everyone else, but you don't really mention it? Or maybe their perfume makes your nose want to close up forever, but you like hanging out with them? Well, Diabolical Decisions is the card game that's designed to help you maybe let your friend know that by god, they talk too loud all the time. Or it might just cause all your friendships to explode. One of the two. Either way, the game is up on Kickstarter now. 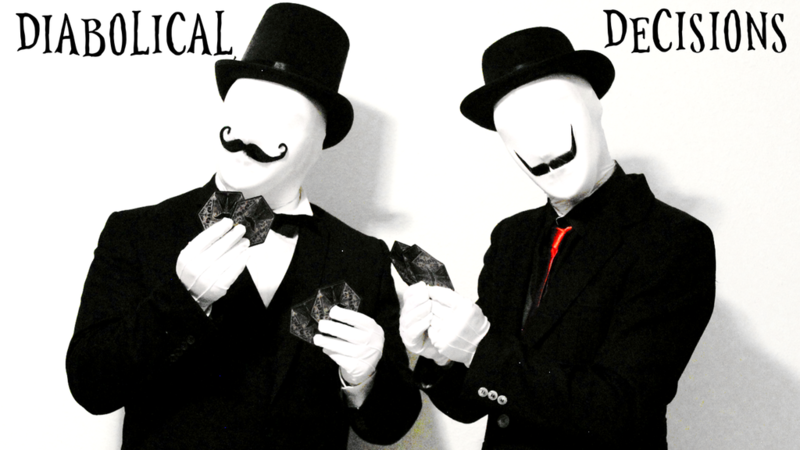 Two mustache masked entrepreneurs from Alaska who call themselves Mr. Decisions and Mr. Diabolical have launched their new card game “Diabolical Decisions: The Game Designed to Destroy Friendship!” On Kickstarter with hopes of crowdfunding $12,000 to make their game a reality. The game is recommended for ages seventeen and up and consists of sixty hex cards they call “backstab cards” designed to create tension an embarrassment among players while insulting them along the way.